Whether you're making it in bulk or in a hurry, we have the perfect method. Can't wait? Infuse two teaspoons of tea per 8 oz. water. After infusing, pour over a glass full of ice and enjoy! Serves one. Infuse one teaspoon of loose tea per 8 oz water. After infusing, chill and serve. Serves one. Grab 4 oz of tea, either loose or already bagged. Fill a one gallon pitcher with cold water. Place tea in pitcher and let set in refrigerator for 6-8 hours. Having company? Grab 4 oz of tea and use the Impatient Method on a larger scale. Grab a one-gallon pitcher. Get out 4 oz of loose tea and place in an infuser or 4 oz of tea bags. Infuse tea using only 1/2 gallon of hot water. After tea is done infusing, pour over a one-gallon pitcher of ice. Start with good quality tea - loose or already bagged. Remember to recycle the tea in your garden! Or check out these other used tea bag ideas. 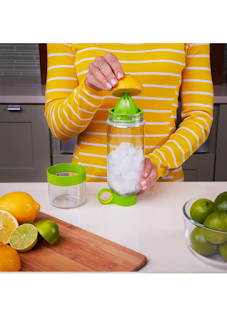 Try our favorite Fruit Infusion Drink Pitcher from our favorite kitchen store. For travel, take along in our Citrus Zinger from Natural Healing Tools.